Social Media can be a great way to grow your brand online, get more awareness, and reach more people. If you need help building your own strategy, the best way to get started is by studying the competition and learning from their successes and failures! Follow these steps to use SEMrush to uncover your competitor’s social media strategy in a matter of minutes. To begin, set up a Project and start the Social Media Tracker tool. To configure this tool, all you need to do is set your main company’s profiles (1), connect a personal account from each channel to activate the APIs (2), and add your competitors’ domains and confirm their social media profiles that you want to analyze (3). After you’ve added all of your competitors’ profiles to the tool, you can choose if you want to schedule email reports (4) and then start the Tracker (5). Once its running you can always add or remove competitors from your reports. Use the tabs to analyze your competition’s social media strategy on each channel: Facebook, Twitter, etc (1). 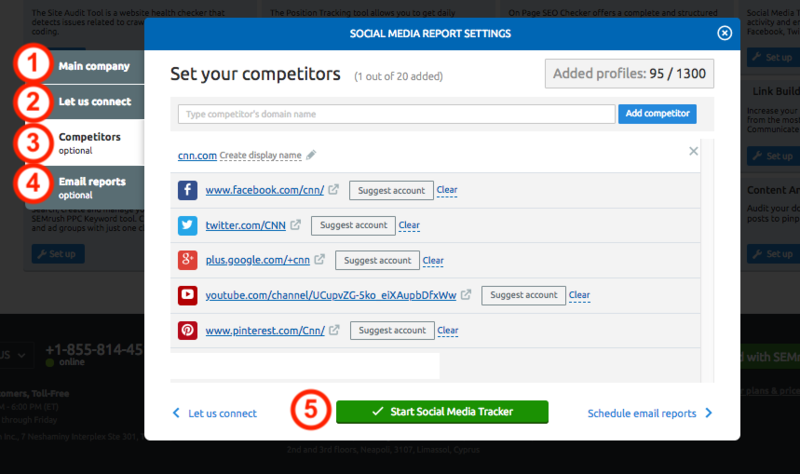 Choose “all profiles” to analyze all of your competitors at once. Identify how frequently they post and check the engagement rate, shares, reactions, and comments (2) of their posts in this channel and set it as a benchmark for your performance. To see your own engagement rate in comparison, simply change “all profiles” back to your company profile. Look for patterns in their messaging. Do your competitors run contests, discounts, or special offers? Depending on the channel, you can filter out certain post types like photos, videos, links, and more. Identify which formats make the most engagement for your competitors and plan to use those similar formats for your own campaign. Identify the top hashtags used by your competitors on Facebook and Twitter with the hashtags reports. You can learn a lot about your competitor’s strategy on Facebook and Twitter by the hashtags they use. For example, do they create their own hashtags? Is their brand name a part of their hashtag? Or do they mainly use hashtags that are trending and jump into the conversation? If certain hashtags are gaining traction, you should try to adopt a similar strategy and see how it works for you. After identifying the main points of your competitor’s strategy on social media, you can use our Social Media Poster tool to plan your own strategy. The Poster tool lets you manage a queue, plan posts in advance on a calendar, edit images, create UTMs, and more. Read the user manual for the Social Media Poster here.